Hi! It’s Kristin from Yellow Bliss Road here to share a super fun idea for the end of the school! 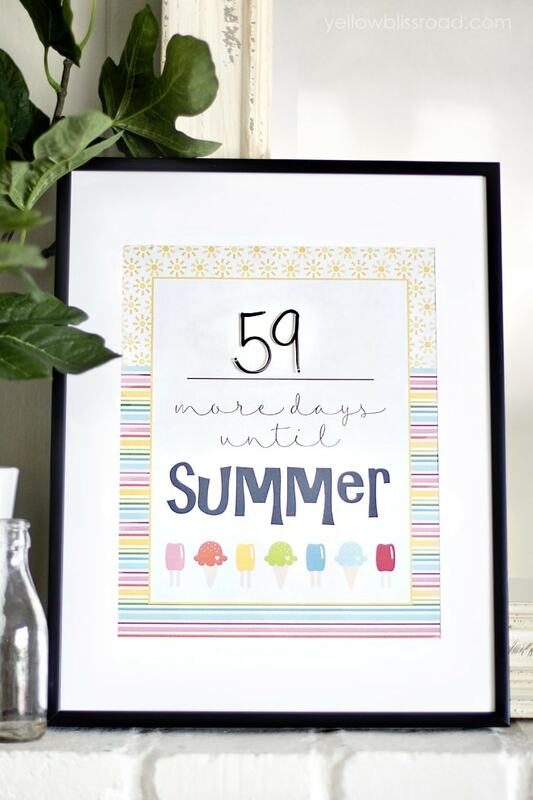 We are nearing the home stretch of the school year, and what better way to build up the excitement than with your own Countdown to Summer Printable?! My kids started a new school this past week. Yes, I realize it’s a little late in the year to be changing schools, but we had some very good reasons. Anyway, it’s been a tough transition and needless to say they are looking forward to summer even more. They have been hounding me about the last day of school – “When is it?” “How many more days? ?” so I decided to give them a little visual aid. We have a calendar but to count each of the days every day, while educational, was getting kind of tiresome. To use this countdown, print it out using the download link below, and place it in an 8×10 picture frame with a glass or clear plastic top layer. Using a dry erase marker, write the number of days left until school is out for the summer. The hard part is going to be remembering to do this each day, but I have a feeling my kids won’t let me forget! 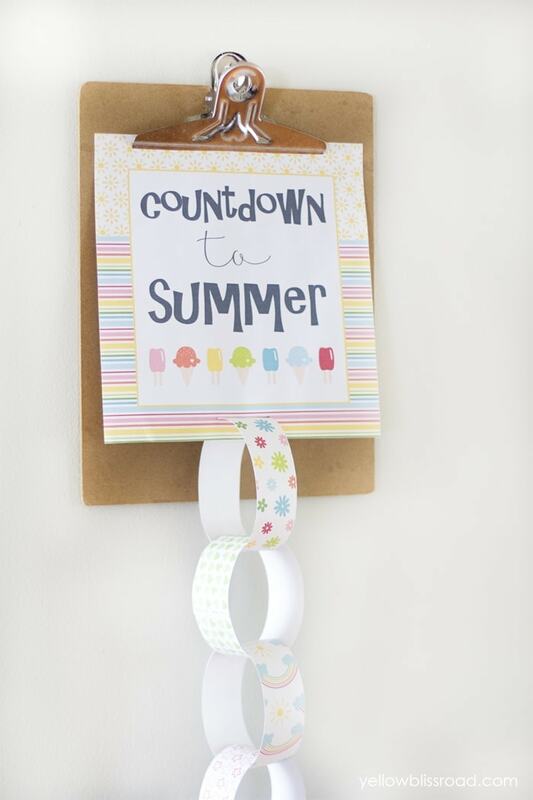 As summer gets even closer, you can using the coordinating Free Printable Countdown to Summer Chain that you can find over at Yellow Bliss Road today. The chain links are also printable and come in 15 different designs. Make your chain as long or as short as you wish! 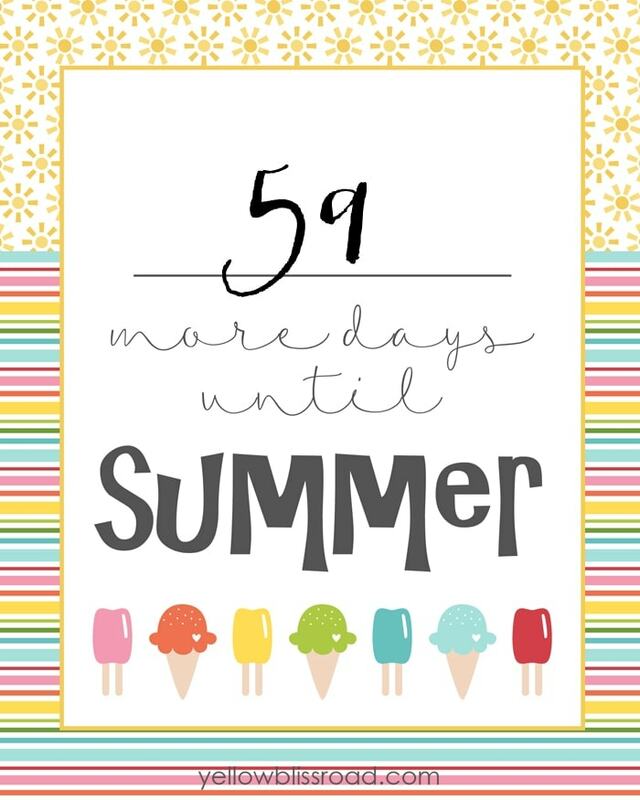 In the next few days, I will be sharing a fun Summer Bucket List as well as some great ideas for the last day of school! I hope you’ll stop by and follow along! She has a super cute set of Chalkboard Printables for the Last Day of School too. And, I’m dying to try her Spicy Lemon, Asparagus & Bacon Pasta! Looks so yummy! And, her Strawberry Lemonade Icebox Cake looks like a perfect spring treat to try! So cute Kristin! I can’t wait to print this off and use it with my girls! !